Now, to increase passenger safety and peace of mind, our taxi drivers must be registered with the Protecting Vulnerable Groups scheme (PVG), which was introduced in February 2011 to improve on the previous disclosure arrangements for people who work with vulnerable groups, including children and disabled people. 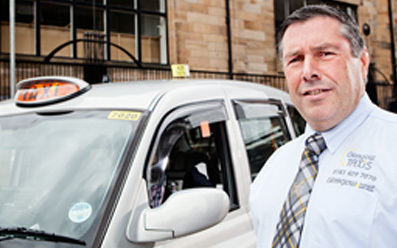 Giving real peace of mind for passengers, all Glasgow Taxis drivers must satisfy these PVG scheme standards before we will employ them, and they must complete any further assessments or meet any updates to the PVG scheme as part of their employment. In addition to these background disclosure checks, prior to being granted a licence to drive a taxi in Glasgow, all our drivers require to pass a test of their knowledge of the City. They are also required to undergo a council-organised training course which includes training in such as customer care and disability awareness. Our customers can be assured that they are being transported by a knowledgeable, fully checked, trained and accountable driver. You can expect a high standard of service from Glasgow Taxis Ltd.